When users include the city name in their searches, it puts these businesses at a disadvantage. In Google’s mind, the simple fact that a listing was not within a certain city made the search not as helpful to searchers in that city. For example, if a Chicago plumbing company’s physical office location is in a nearby suburb, searchers in Chicago would have a hard time seeing that particular plumbing business listing in the Local Pack. However, since the Possum Update launched, these issues have seemingly been fixed as the actual city limits are playing less of a role. It is not yet confirmed whether or not Google Maps was given an update to accommodate this or if the search algorithm was tweaked. However, we do know progress is being seen. In the past, the local algorithm filtered out local profiles that shared either a phone number or domain in order to weed out duplicates in the Local Pack. Since this new update, we’re seeing another dimension added to the filter: the address. This hasn’t really been an issue as duplicate addresses are almost impossible for most businesses; however, for certain industries, such as health care or law, multiple practices can be located in the same building. Many offices can share an address if the building is large enough and adding a suite number has proven effective. 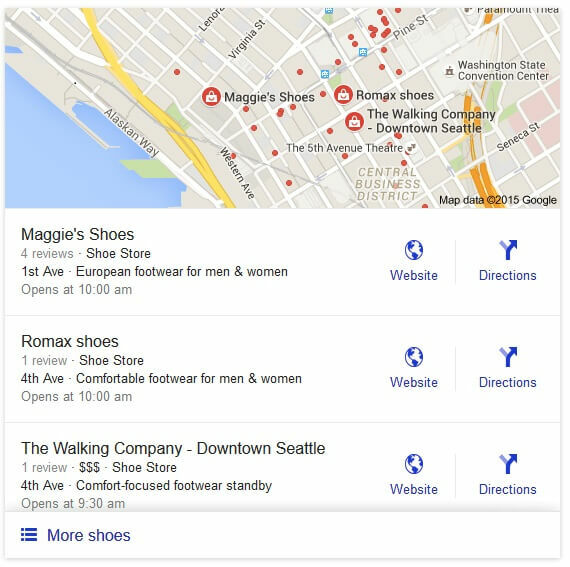 For example, if a user searches “podiatrist Madison Wisconsin” and multiple podiatrists are working out of the same building with the same address, only one of the listings may be returned in the Local Pack because Google will classify them as duplicate listings. In order for businesses to avoid being filtered out by Google in a situation like this, companies should provide a business license to Google, particularly if listings are negatively affecting their website rankings. This will distinguish the listing/domain from another business with the same address. NOTE: The filter doesn’t remove perceived duplicates from local listings. Instead, it acts as an organic search algorithm, choosing one listing while pushing the others down. It seems that Google’s local filter is working independently from its organic filters, as we’re still noticing local search results with a link to a website Google is filtering out of its index. For example, if Google’s algorithm classifies a page as duplicate and chooses to filter it out of their SERP, a local result with that same page associated with the listing can still be returned. Additionally, some businesses have the opportunity to rank twice in the 3-pack whereas in the past, one of the two listings would have been filtered out. This could mean that your business has two opportunities to display in a 3-pack for a “www” version of your website and a non-“www” version. This shows how the local filter operates separately from the organic filter and how they are less connected than before. The new algorithm update is using IP address locations to serve more tailored local results to users. For instance, if a user searches for “Smith Computers” from their HQ office in Detroit, he/she may not see the same results as someone who is searching for “Smith Computers” in a town where the company has a store location. Additionally, the further you are from the city, the more zoomed-out the map appears in Google Search. As the map zooms further away, the more positions the business listing drops in the SERP. A user may even see the result drop even if they include the service and city in the search query, whereas a user in that town would have likely seen that result first. For marketers, this means it’s important to make sure the searcher location is set to the right city or town when tracking the ranking. A great tool to use in this scenario is geo ranker’s Free Local Rank Checker & Tracker. The order of keywords has become more important with this update. Queries such as “Chicago Hair Salon,” “Hair Salon Chicago” and “Hair Salon Chicago, IL” used to deliver fairly similar search results because Google recognized them as meaning the same thing. Now it appears that in some cases, a small change in keyword order can shift 3-Pack SERP position. This means that it may be best practice to use multiple iterations of a keyword on different pages of website, or select the iteration with the highest search volume. There has been quite a bit of variation with the results which may indicate that Google is still testing the algorithm. Like algorithm updates in the past, Google tends to test attributes and amend them as needed. In the meantime, these ranking signals should be monitored for local results. For more information on algorithm updates, contact Performics today.